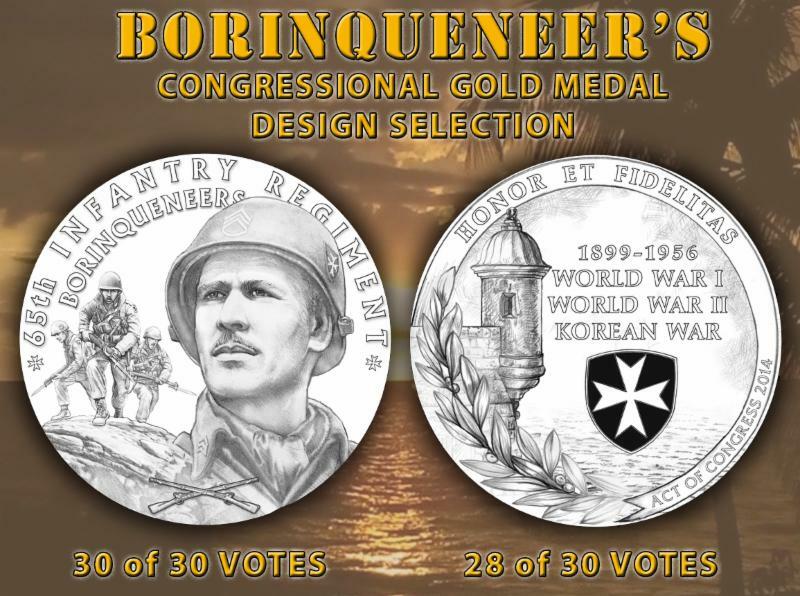 The U.S. Mint has presented design options for the Congressional Medal for the Borinqueneers to the Citizens Coinage Advisory Committee (CCAC), which chose the design above. The design will now go on to the Fine Arts Commission, and to military historians who will confirm the accuracy of the uniforms, according to Samuel Rodríguez, a member of the Borinqueneers Congressional Gold Medal Design Liaison Team. It has been more than a year since President Obama signed the bill that awarded the Borinqueneers the Congressional Gold Medal, and the Borinqueneers Congressional Gold Medal Design Liaison Team has been working closely with the CCAC to make sure that the input of the Borinqueneers and their community was heard and considered in the design process. Once the CCAC has made the final decision, they will make an official recommendation to the Secretary of the Treasury, who will authorize the production of the medal. The Borinqueneers, also known as the 65th Infantry Regiment, were a primarily Puerto Rican regiment in the U.S. Army which was active from the turn of the 20th century and served in both World Wars and in the Korean War. The regiment was dissolved in 1956, when segregation ended in the armed forces. However, just as the 65th Infantry was an outgrowth of the volunteer regiment formed in Puerto Rico in 1899, it also continued beyond the official end of the regiment in 1956, being transferred to the Puerto Rican National Guard in 1959. The Borinqueneers were honored with the Presidential Unit Citation, a Meritorious Unit Commendation and two Republic of Korea Unit Citations, including personal praise from General MacArthur. Individual Borinqueneers have received individual honors, including Distinguished Service Crosses, Silver Stars, and Bronze Stars. The Congressional Gold Medal, awarded just over one year ago, was the culminating honor for the regiment. See all the proposed medal designs, the discussion in the committee, and a letter from Senator Marco Rubio at the website of the Design Liaison Team.